Recorded and mixed by Jean-Boris Szymczak & Andreas Stoffels at Studio P4, Berlin, on Nov. 27, 2012 .
recording producer for SRF 2 Kultur: Peter Bürli; mixed by Christian Weber. Liner notes by Peter Margasak. Photo: Madeleine Boschan. Cover art and graphic design: Jonas Schoder. ﻿Nach sieben Jahren Zusammenarbeit läuft die Berliner Band Squakk zur Höchstform auf. Das Album "Willisau & Berlin" ist ein Meilenstein des aktuellen, lebendigen Jazz. 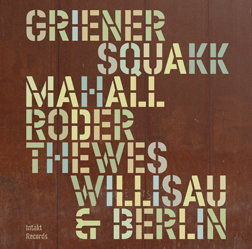 ﻿After seven years of collaboration the Berlin band Squakk is at the top of their game. 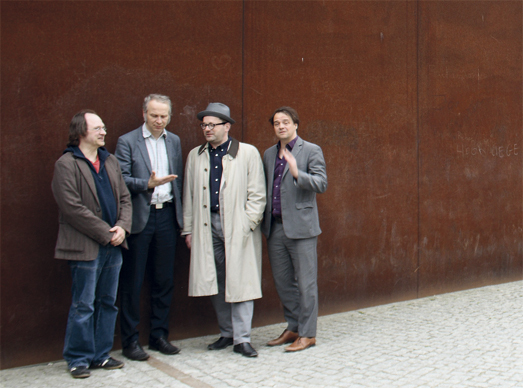 The album "Willisau & Berlin" is a milestone of the current vital jazz. Squakk plays according to Chicago-based writer Peter Margasak "a wonderfully loose, improv-heavy strain of free-bop that liberally draws upon much of jazz history." And he comments: "What's most striking and satisfying about the album is the remarkable level of interaction between the musicians. The tunes are durable but spare and exist largely to foster inspired improvisation. The «Neue Zürcher Zeitung» is thrilled with the highlight of the Willisau festival: "The quartet Squakk immediately spread joy and happiness, big-time. The musicians appeared to be cunning and crafty: trombonist Christof Thewes, clarinetist Rudi Mahall, Jan Roder, bass and Michael Griener on the percussion. The music however sounded raw and grungy like fresh organic vegetables."